On Friday, September 21st, the people of Al Walaja village, in coordination with international and Israeli activists, came together to protest the Apartheid wall as they have done before. 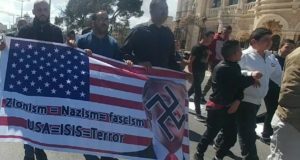 This week however, they added a variation, trying to demonstrate also against the matrix of repression throughout the West Bank, represented by roadblocks in this village. They wanted to combine the struggles, against the building of the Apartheid Wall, and against the road blocks – the older means of restricting the freedom of the Palestinians in the occupied territories. This worked with the usual success… as the policy of the state forces is to allow the removal of roadblocks during the demonstration and restore them soon afterwards. 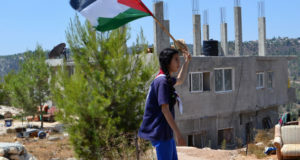 “Like in every Friday of the last few months, this Friday too, tens of Palestinian peace activists, Israelis, and internationals, arrived for the demonstration against the Apartheid Wall which is being built in the Walaja village near Har Gilo. As the previous demonstration that was at the route of the Apartheid Wall was dispersed with high level of violence – with nine injured demonstrators, this week the people chose the way to the main entrance road of the village. With joint efforts, they succeeded to remove the road block and enabled free traffic to the neighbouring Palestinian villages. The Apartheid Wall is being built on the lands of the village to separate them from the colonialist settlement Har Gilo. 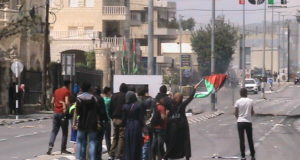 It will encircle the village completely leaving only one entrance under control of the Israeli soldiers.